Tuffy was our first paint stallion. We broke him when he was 2 years old, and rode him everywhere. He was very gentle and would do anything you asked. He was broke to ride and drive, plus you could shoot a gun off his back. He was bomb proof and very smart. He could untie any lead rope and open any gate, he would sit there until he got it. He ground tied, so we would tie him out in the yard to graze. A couple years ago he lost his eye sight due to moon blindness. You can still load him on a trailer and ground tie him. He listens to you and will follow me anywhere. He loves baths, he will stand there and let you spray him down, then turn so you can do his other side. Now he is in a pasture with some goats enjoying his retirement. Tuffy is 14.3 hands tall. Very smart, and easy going. I B GOGOS GLAMOR GIRL- 2005- BAY, SOLID, MARE. IBCHALLENGERSTUFFNESS- 2003- BLACK, SOLID, MARE. MISS ABBYS TUFF ENUFF- 2003- BLACK, TOBIANO, MARE. TITANS TUFF CHEYNE- 2003- BLACK, OVERO, MARE. 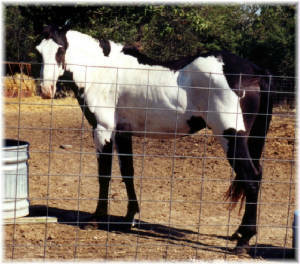 TUFFYSLASTSTANDTILLY- 2003- BLACK, OVERO, MARE. I B AN IVY GEM- 2002- GRAY, OVERO, MARE. I B ATUFF LADYLIZ- 2002- SORREL, OVERO, MARE. I B BONANZAS SHOWDOWN- 2002- BLUE ROAN, SOLID, STALLION. I B STROKERS STARLIGT- 2002- BAY, SOLID, MARE. I SHOULDABEEN LIGHTN- 2002- BLACK, SOLID, MARE. IB CHALLENGERS MIGHTY- 2002- BLACK, OVERO, STALLION. IB CHESSYS TUFF AMIGO- 2002- BLACK, OVERO, STALLION. CHESSYS TUFF DYNAMITE- 2001- BLACK, OVERO, MARE. DESTINYSTUFFCOCA- 2001- BLACK, SOLID, MARE. I B DOMINOES ROBIN- 2001- BLACK, SOLID, MARE. I B BROOKES SPIRIT- 2000- BAY, OVERO, MARE. I B QUICK ENUFF- 2000- SORREL, SOLID, MARE. IB DESTINYS TUFF LUCK- 2000- BLACK, OVERO, STALLION. PATCHES BB TUFFIE- 2000- BLACK, OVERO, MARE. POCOS STORMY DANCER- 2000- DUN, OVERO, STALLION. I B DANCERS LEVI- 1999- BAY, SOLID, STALLION. I B FLAMES RUTHIE- 1999- DUN, SOLID, MARE. I B SUNSHINES COMANCH- 1999- BLACK, SOLID, MARE. DANCERS TUFF RENO- 1998- BLACK, OVERO, STALLION. I B MELODYS ACE- 1998- BLACK, SOLID, STALLION. LITTLE WHITE FOOT- 1998- BAY, OVERO, MARE. I B BLAZE HARMONY- 1997- BAY, SOLID, MARE. I B CHIEF TEDDY- 1997- BAY, SOLID, GELDING. 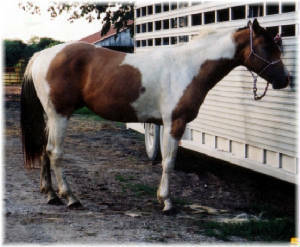 I B LADY BRITCHES- 1997- BAY, OVERO, MARE. I B MAXS MELODY- 1997- BLACK, OVERO, STALLION. TUFFYS SMOKEY BOY- 1997- BLACK, OVERO, STALLION. I B TUFF N SWIFT- 1996- BAY, OVERO, MARE. PRIMER II- 1996- BLACK, SOLID, STALLION. ROYAL T TUFF- 1996- BAY, OVERO, MARE. 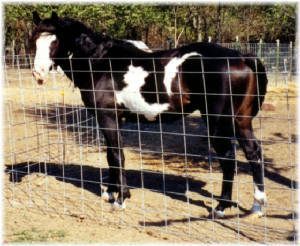 ROYALTY IN BLACK- 1996- BLACK, OVERO, STALLION. Lucky was one of Tuffy's sons. He was a chip off the old block. Just like his father. Anything you asked, he would give. We sold him because we where going in a different direction and he twisted his gut a year ago and had to be put down. He is surely missed by all ! LUCKYS THUNDER CHIP- 2005- SORREL, TOVERO, STALLION. LUCKYS CLOUDY SKY- 2004- BLACK, TOVERO, MARE. LUCKYS GLAMOROUS GUY- 2004- SORREL, OVERO, STALLION. LUCKYS GOLD TITAN- 2004- GRULLO, OVERO, GELDING. LUCKYS RED BONANZA- 2004- SORREL, SOLID, STALLION. O SONNYS RED LUCK- 2004- CHESTNUT, SOLID, STALLION. STORMYS LUCK- 2004- BLACK, OVERO, MARE. LUCKYS BONANZA ROSE- 2003- SORREL, SOLID, MARE. LUCKYS LIGHT FOOT- 2003- BLACK, TOVERO, STALLION. We purchased Chief as a weanling. Broke him when he was 2 and rode him everywhere. He was quiet and gentle. A real gentlemen with the mares. He was Homozygous for the paint gene. You never knew what you were going to get, even with the same mare, they always had a foal that was a different color. We lost him a few years back, in the pasture. One of the mares kicked him in the face. Now he is buried under a big oak. I have some of his Daughters, and boy are they nice. Chief was 15.1 hands tall. Very smart, and easy going. 17-BAY, 5-BLACK, 11-BUCKSKIN, 6-PALOMINO, 10-SORREL. CHIEFS BABYFACE BLAZE- 2005- SORREL, TOBIANO, MARE. CHIEFS COCOA TITAN- 2005- BUCKSKIN, TOBIANO, STALLION. CHIEFS CUTE RANGLER- 2005- BAY, TOVERO, STALLION. CHIEFS DIAMOND DIXON- 2005- PALOMINO, TOBIANO, MARE. CHIEFS REBEL CHEYENNE- 2005- BUCKSKIN, TOVERO, GELDING. CHIEFS RENO FORCE- 2005- SORREL, TOBIANO, MARE. CHIEFS SNOWBALL STRO- 2005- PALOMINO, TOVERO, MARE. CHIEFS SWEET APACHE- 2005- SORREL, TOBIANO, MARE. CHIEFS SWIFT CUPID- 2005- BUCKSKIN, TOBIANO, STALLION. CHIEFS VALENTINO SAL- 2005- BAY, TOBIANO, STALLION. CHIEFS CHEYENE COMET- 2004- BAY, TOVERO, MARE. CHIEFS COCOA CHEX- 2004- BAY, TOBIANO, GELDING. CHIEFS CUTE LITTLEKAY- 2004- BAY, TOBIANO, MARE. CHIEFS DIXON DEE- 2004- SORREL, TOBIANO, MARE. CHIEFS FANCY TIPTOP- 2004- BLACK, TOBIANO, MARE. CHIEFS SHOSHONISPIRIT- 2004- BUCKSKIN, TOVERO, STALLION. CHIEFS SWEET REX- 2004- SORREL, TOVERO, STALLION. CHIEFS TRASHY FEATHER- 2004- BLACK, TOBIANO, MARE. CHIEFS TURBO BLAZE- 2004- SORREL, TOBIANO, STALLION. CHIEFS TURBO FORCE- 2004- BUCKSKIN, TOBIANO, STALLION. CHIEFS VEGAS STROKER- 2004- PALOMINO, TOBIANO, MARE. CHIEFS BRAZEN BULLET- 2003- BAY, TOBIANO, MARE. CHIEFS CRYSTAL BLAZE- 2003- BAY, TOBIANO, MARE. CHIEFS GLAMOROUS DAFY- 2003- PALOMINO, TOVERO, MARE. CHIEFS LEO BUD- 2003- BUCKSKIN, TOBIANO, STALLION. CHIEFS ROYAL MONTANA- 2003- BUCKSKIN, TOBIANO, STALLION. CHIEFS SWEETNESS- 2003- BAY, TOBIANO, MARE. CHIEFS SWIFT BRITCHES- 2003- BAY, TOBIANO, MARE. DIXONS CHIEF REVELL- 2003- BAY, TOBIANO, STALLION. MAMAS GOLD- 2003- BLACK, TOBIANO, STALLION. CHIEFS CHARCOAL BELL- 2002- BLACK, SOLID, MARE. CHIEFS DANCING LEX- 2002- BAY, TOBIANO, STALLION. CHIEFS GYPSY FIRE BUD- 2002- BLACK, TOBIANO, GELDING. CHIEFS HARMONY SKIP- 2002- BAY, TOBIANO, STALLION. CHIEFS JACKIE BAR- 2002- BAY, TOBIANO, MARE. CHIEFS LADY AMBER- 2002- BAY, TOBIANO, MARE. CHIEFS LINX OF BLAZE- 2002- PALOMINO, TOBIANO, STALLION. CHIEFS ROYAL T LACE- 2002- BAY, TOBIANO, MARE. CHIEFS SCAMPER DOMINO- 2002- BUCKSKIN, TOBIANO, MARE. CHIEFS SWEET MAJOR- 2002- BAY, TOBIANO, GELDING. CHIEFS SWIFT SPIKE- 2002- SORREL, TOBIANO, STALLION. DESTINYS GINGER- 2002- SORREL, TOBIANO, MARE. BUCKS RANGER ARAPAHOE- 2001- SORREL, TOBIANO, STALLION. BUCKS THUNDERBOLT GO- 2001- SORREL, TOVERO, MARE. CHIEFS HARMONY CISCO- 2001- BAY, TOBIANO, MARE. CHIEFS KELLY BELL- 2001- BUCKSKIN, TOBIANO, MARE. CHIEFS SKY DIXON LB- 2001- BUCKSKIN, TOBIANO, MARE. MISS COYS GOLDEN LACE- 2001- PALOMINO, TOBIANO, MARE. MY CHIEF SWIFTCOCHISE- 2001- BUCKSKIN, TOBIANO, STALLION.